Ahmedabad, Metro Rail News: The Gujarat Metro Rail Corporation (GMRC) is all set to start a trial test run of the first metro train from February 18. A team of Research Designs and Standards Organisation (RDSO) is reaching the Ahmedabad Metro site on February 18 and the metro’s first trial run on tracks will be carried out under the close monitoring the RDSO team. The RDSO officials will carried out the various function tests of the train in Ahmedabad before issuing the fitness certificate for starting the metro train in passenger service. The trail test will likely to complete in 15 days and the train is expected to start its commercial run from the first week of the March subject to getting safety clearance from the Commissioner for Metro Railway Safety (CMRS). 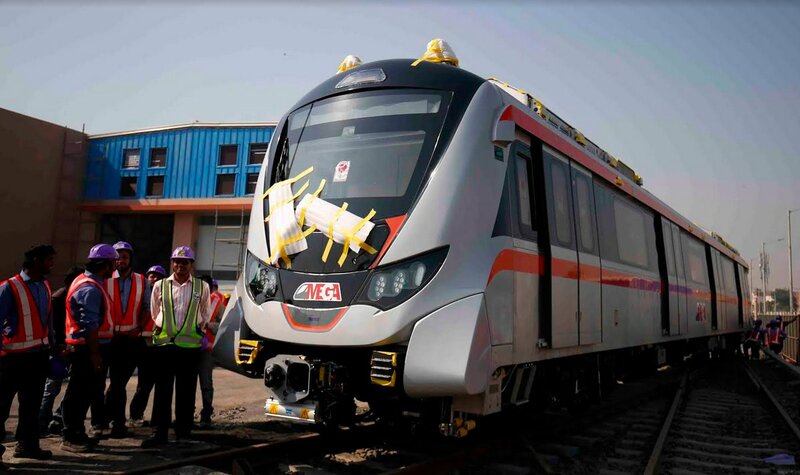 The first trainset of the Ahmedabad Metro Rail project, which reached in its Rolling Stock depot on January 1, 2019, is undergoing various checks and trials by the technical experts. The second trainset will depart from the Hyundai Rotem’s South Korea factory on 17th January and is expected to arrive in Ahmedabad by February 7 after which tests and trials will be conducted on it as well. After the completion of statutory trials by the RDSO team, the safety inspection will be carried out by the CMRS and the trial of both trainsets. Once these are completed and getting safety clearance from the CMRS, the trains will be scheduled to start in a commercial run. The GMRC is planning to start a regular run of the metro train on the Apparel Park to Vastral stretch by the first week of March. Sources said that GMRC had first decided to carry out the trial run by January 15 and then get the inspection done by RDSO and CMRS, after which the train was to make commercial runs. But since the government wanted to have the metro train flagged off by the Prime Minister Narendra Modi, they decided that the run would be conducted only after all safety certificates are received. Next articleWhy Noida Metro is still waiting for launch date?